Well, this is the first blog i have ever done, i don't know how it will turn out, or if anyone other than myself will read it, but here goes. The main reason for writing this is more for myself. I can't say i have much of a reason for writing this. I have been thinking about my past and where i am in the world around me. It is really just a dumping ground to put down my thoughts and feelings. As you will be able to tell I am not a writer, so this is going to be more of a brain dump than anything else. It might be a bit random (a bit like me). So, if you are not interested in knowing a bit (maybe a lot) about me then best to stop reading now. Well, my first day was december 10th, 1969. I was born in waikato hospital in hamilton new zealand. I have 2 older sisters, Carol who is 2 years older than me and Liz who is 18 months older than carol. I don't really remember much of my childhood, my sisters recon i have blocked alot of it out, personally i just think it is because my memory can be pretty crap at times. I do still have snippets of memories of things. I remember getting lego for christmas when i was a kid, i can't remember how old i was and i am not sure why i remember it so much. It wasn't just that it was my first set of lego. I remember us kids sitting around the christmas tree excited at opening presents. Dad sitting on the sofa having a cup of tea that one of the girls made. Not sure where mum was i can't really remember her being there, but i know she was. I think most of my younger childhood was ok, there are good memories of when my aunt and uncle came over from from england and we travelled all over the north island showing them places. I do remember bits and pieces of it, probably mainly because my sisters have photo's of it. I do remember being teased alot by my older sisters. liz used to push her fingers into my sandwiches just because i hated it. My father was a chef at the biggest hotel in hamilton, and we used to go to the hotel all the time to go for swims in the pool and play with the managers kids. I used to love being in the kitchen with dad, think it was mainly because whenever we were there he used to cook us lovely food. It was good as it was only a couple of miles from home, and really easy to get there. The House we lived in is still there, and still looks the same, and it has to be 30 years since i last saw it. My dad had it built before i was born. I loved that house. I had a room to myself and the girls had to share ;) I do remember getting locked in my room one day when the door of my room and cupboard jammed together. I don't have lots of memories of being there, i do remember my sisters fighting all the time as girls tend to do, but my sisters did it to the max. Carol even went at liz with a knife one time, but as with everything they always ended up making up again. I know my parents split up a couple of times while i was young but i only really remember bits of one of the times. In new zealand back then the mother always got custody. We were put in a foster home, of which i don't remember much other than i didn't really like the kids in the family that we were with. Most of what i know of that time i have gathered from chats with my sisters over the past 13 years. I remember dad coming over every weekend he could. Mum never came to visit us that i remember, and from what i was told she took in foster children of her own. That is probably the biggest issue i have with my mum, other than the fact that she was never very motherly to me. I don't know how long we were in the foster home, but it felt like a long time. I do remember carol got so annoyed with our foster family that she ran away and walked all the way to dad's work. I remember dad turning up when he was told she ran away and went looking for her. Eventually my parents got back together, but i don't think there was ever much in the way of love between them. I think they got back together and stayed together more for us kids than anything else. We were only there for a couple of years when carol decided to take a sicky from school and decided to cook some chips, unfortunatly she ended up setting fire to the kitchen. We lost alot of stuff to fire damage in that house, and as you can imagine it was time to move again. We moved to a small area not far from the city called westmere. The house was ok, it was close to a beach. I even started going to scouts which i do remember liking. There was an old plane museum which i remember loving to go around. I don't remember to much of that area we were only there for a few years when my mum left us again. that was when liz kind of stepped in and became mum. Dad was busy working stupid hours trying to earn enough money to look after us all. It was a strange time for us all. I do think liz got a bit carried away at times and was a bit to bossy, but i know she was just trying to look after us. I can't remember when we moved from there, but dad managed to get us the house at the staff quarters of the hotel he was working in. Doesn't sound like much, but it was a great place, right over the road from the hotel, about a 2 minute walk to the beach in takapunua. 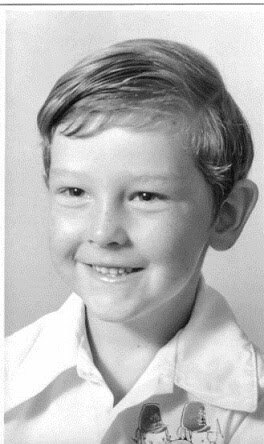 I only had 6 months of intermediate school there, so must have been about 12. in 1983 i started at takapuna grammer school. I can't say i was a great student, but i wasn't a bad one either. Living in takapuna was great, i could walk along the beach home, hang out at the shopping center (as kids do) . I was always a quite person, and didn't really make many friends, but was lucky enough to have met heathcliffe, and through him i met ashley, mark and andrew. 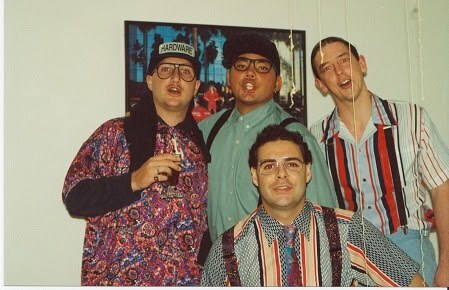 They were great friends, spent most weekends and evenings doing stuff with them. I can;t remember much of it, but there was always something happening even if it was being boys and playing games on heathcliffs commodore 64, going for a ride on our bikes, taking one of the hotel's catamaran's out into the harbour. I had alot of fun during the years i lived in takapuna, ashley tended to be the ring leader of us all, and usually came up with the stupid ideas that we all followed. Me, carol and liz all did work in the hotel that dad worked in to earn some extra spending money, liz did some waitressing, me and carol did the kitchen hands work. It was hard tiring work sometimes, but i did love it and it gave me lots of money to spend :). Ashley was the first to leave school (got an apprenticeship) and mark moved to maramarua, so we didn't see to much of him for a while. We moved around a few times in the years to come, usually spending a couple of years in any one place, but all around the north shore. I can't remember all the places, none of them were really that remember-able other than the fact that it was still easy enough to get to school in takapuna and my friends still came out to where ever i was living so we could muck around. 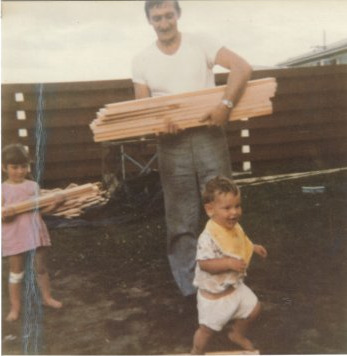 I can't remember when dad changed jobs, but at some point he moved to the browns bay motor hotel, i know at times he hated it but again he stayed there because it paid the wages so he could look after us all. When we were 15 we all went to get our licence before the change in the rules, I had to sit mine 3 times (trust me i am a better driver now) i just managed to get my licence before the change in the law which meant you had to have a learners licence. It was great to have my licence, dad used to let me drive him to and from work so i could have the practice, and it also meant that i could drive to work myself (yep, still worked in the kitchen with dad) the good thing there was that most of the waitresses were my age as well. As i think is a pretty common theme in my life i did have a crush on a couple of the waitresses, but could never get the guts up to ask any of them out. Unfortunately it didn't stop ashley asking one of the girls i like out. It was a bit of a disaster, her and 3 guys for a day out at waiwera hot pools. After that i think i was a bit to embarrassed to talk to her. Since ashley had a car (hand painted silver moris minor) we all used to think we were cool, still to young to go into the pub, we used to cruise up and down queen street (yea, sounds stupid, but it is what people did in auckland) some times it was just me ashley and heithcliffe, other times mark would come up, or andrew would come out. It sounds pretty boring when i read it back, but we had a great time, us in the silver morry cruising up the road next to the older guys in their supped up v8's. cruising up and down queens street trying to make ourselves look cool for the girls (and no it didn't work) We did meet a few girls that way but seriously most of the time we just had a laugh and then went home. It is amazing to think how little we really had to do to have a good laugh back then. College was fun, but i ended up with 3 jobs to pay for it, so didn't get as much of a social life as i would have liked. Not to much of note while i was at college, worked far to much, me and ashley went out alot, we had a couple of regular clubs we used to go to. We used to do a lot of weekends away, just the boys (yes sometimes with the girlfriends as well), go pick up mark and go somewhere. We did end up at rotorua quite a bit or hamilton, used to have a good laugh doing bugger all when i think about it. When we got to marks place we would either take his car (which he didn't have a licence for so couldn't drive) or mine or depending on how many of us, both. They were great days, we did all sorts of stupid things. camping would quite often consist of someone sleeping in one of the cars, we were never really that organised, it would usually be turn up and see if we could stay somewhere. 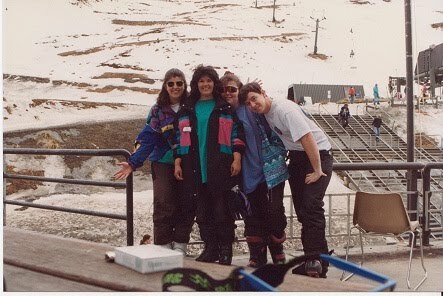 Me ashley and heithcliff decided to learn to ski one year, which consisted of sitting on a bus for 4 hours to get to the ski lodge at Mt Ruapehu, a 15 minute ski lesson the next morning and they let us roam the mountain. We were all atrocious, the only way i could stop was to fall over, or crash into someone. I remember getting VERY drunk and throwing up in the bus (yea, not my proudest moment) but it was fun. 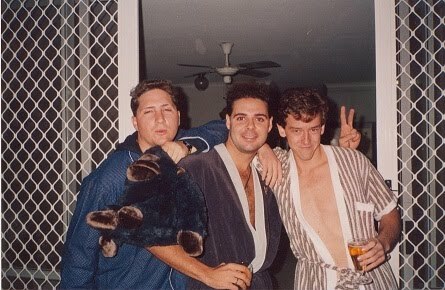 Ashley moved to australia when we were about 19, so me heithcliffe and andrew used to hang out a bit more. I had a couple of girlfriends during that time did lots of stupid things, some that i can say i am not proud of, but obviously thought they were good ideas at the time (yea i don't think so). I failed my first year of college, mucked about to much in the business comms course (you couldn't tell i wasn't a good writer ;) ) During my first year i had to go do work experience for a window manufacturer for 3 weeks, which came in handy as i got work with one of their affiliates when i finished college for the year. I spent the next year working for the company altherm building a window manufacturing and quoting system which was lots of fun for me as it was a real challenge. In the evenings i resat my business comms course which thankfully i passed the second time around. 1 year of working was good for me, gave me lots of experience (and spending money) so that when i went back to college i was well prepared for it and did a lot better. I continued to work for altherm while i finished my diploma (2 more years) and ended up in the top of my final year. The course was quite tough, they took in 200+ students in the first year and weeded it down to 10 in the final year. I was really happy that i did well enough to be accepted into the 3rd year, and managed to finish the course 4 months early, along with the city and guilds qualification from the uk. I spent the 2 years at college doing the normal things, going out when i could with friends, working 3 jobs. One of those jobs was a kitchen hand working in the hotel that dad worked in. That was quite handy as we would travel home together. It gave us quite a good chance to get to know each other a lot better. there were times when we would get home we would quite often sit and play cards for hours just chatting. I do miss those evenings, dad was like just another one of my mates, I could tell him anything that was going on in my life, well nearly anything. I was never closer to dad than those years. My 21st birthday was good, but for some reason when ashley came back for a holiday he decided to book his 21st birthday party on the same day. Mine ended up being an afternoon bbq with some friends and family. it was a good day even if it did finish by about 7ish. me ashley, mark and heithcliffe then went on to ashleys party which was just his family, and i was quite pleased that mine was more fun. you might get the idea that i was a bit jealous of ashley, well you are right, he always had everything he wanted, always got the girls, it was a pain at times, but what can i say, he was my best friend so i put up with him. When i finished college i decided to follow ashley to australia. I moved in with him in his parents flat in mermaid waters on the gold coast. It was a great place, 5 minute walk to the beach, 20 minute walk into surfers paradise. perfect place for a single young bloke. Obviously i didn't have a job, and money was running out quickly, so i took a job at sea world cooking burgers. It wasn't much but it did have benefits. Because it was in hospitality, i got free entry into most of the clubs on the coast :). It was also part time so i could spend some time looking for a proper job, the gold coast wasn't really a good place to look for computer jobs, it is more a touristy area than anything. I think i only worked there for about 3 months when i got a job working for RCI Australia. The interview was really strange, the it manager ran the gold coast marathon, so we actually spoke more about running than any computer work. The people there were great, i made lots of really good friends there (some i am still in touch with) It was a very social company and a large group of us tended to go out on a regular basis. The main people i used to hang out with were richard, neil, simon, julie and kylie. there were alot of others, but those guys were always there. Eventually ashley moved out to live with joanne, and neil moved in. We had some good parties in the flat, but eventually ashley's parents wanted to move over so we had to move out. regular girlfriends, richard and kelley, simon and becky, neil and vi. I met sue through julie (her sister), she ended up coming out with us quite a bit and we became friends (she also went out with scott for a while). Not alot else really happened in the next few years, had some good times, far to much to drink. I met lots of nice people, alot that i worked with, some that i met while out partying. I did still do a bit of travelling in australia, loved going up to noosa for the weekend or up to the hamilton island. One of the benefits of working for RCI was that there were always rooms available in the timeshare places, whenever there was the party would end up there. Most of the holidays around that time wern't really that memorable, i do remember going to club med in the great barrier reef with neil and richard which was a good laugh, and going to queenstown in new zealand with julie, sus and kylie, I was the only skiier so the others did ski lessons while i was skiing the mountain (still pretty badly). I got my first SLR camera for that holiday, and remember trying to figure out how to work it for at least a day. we were only there for a week, but it was a good laugh. We did all the usual things you do when in queenstown (other than skiing) we went on the shotover, went sky diving over the remarkables. the others headed back to aus and i went up to napier to our office there, spent a week there which was a laugh, did my first wine trail with the guys in the new zealand office which was great, loved the week i got to spend there. 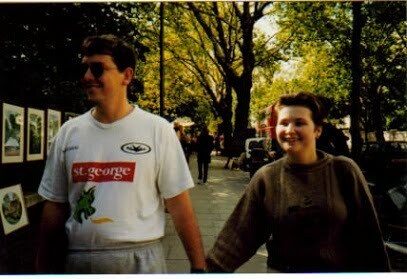 In i think it was in 1994 i met a girl that i fell in love with, I know i shouldn't have as i only knew her for a week. she (yes i can't remember her name) was on holiday from the uk. I got so infatuated with her, when she left i bought some land and built a house just in case she would come back (yes we had talked about her moving over as her mum lived in sydney). We talked on the phone for a few months after that, but yea, you guessed it she didn't come back. I know my friends were a bit worried that i would throw myself at the first woman that smiled at me for a while after that, luckily i wasn't quite as bad as they thought. Having a house built is a pain in the arse, and i would never do it again. I have to say i wouldn't have done it that time if it wasn't for scott, he lent me most of the deposit as i didn't have enough at the time. The house wasn't anything special, i had a good sized piece of land on the side of a hill, so had to build a stilt house. I couldn't afford to have the garden done, so that stayed as a big pile of dirt for a couple of years. It took 6 months to have the house built, it was really exciting going up to see it progressing. when it was finally done richard and scott both moved in. The place ended up being a drop in for anyone that wanted to come along. We had a bbq on the balcony, and yes we did use it quite a lot. We had some good parties there, and i tried to spend time making something out of the garden (no i am not a gardener). I had a fun weekend one time after hiring a bobcat (small tractor) and moving all the dirt around so it wasn't in a pile. I think we managed to roll the bobcat over at one point. I moved jobs after 5 years at rci to the the gold coast dairy. 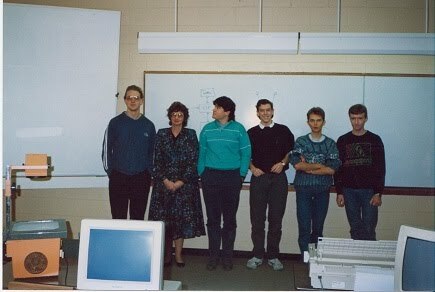 I not only did development stuff then, but was doing all their network admin and setup. It was an ok job, i was my own boss, got to play around with whatever technology i thought they needed. It was there that i started playing with java (the programming language i do now) when it first came out. the job wasn't much but it did give me alot of freedom. My sister liz got engaged in the uk, and was bringing her fiancée to meet dad, so they flew to sydney on the way over to new zealand and i spent a few days with them. It was nice to see liz again, i think it must have been about 6-7 years since i had seen her at that point, and we hadn't really kept in touch that much other than the occasional letter. After a while all the guys moved out and i had the house to myself. I did have a flatmate for a little while, but weird is probably the nicest thing i could have said about him and i decided it was better to live by myself again. It wasn't to much longer before liz set the date for her wedding and i decided it was time for a change of scene. The plan was to spend 2 years in the uk traveling and working, then come back to aus. I rented my house out to a couple of guys that were friends of friends, packed my bags and hopped on a plane to the uk. It was really sad to say goodbye to everyone, but it was only going to be 2 years so i new i would see them again. Sue was also coming over a few months later so we were going to flat together. At that point i didn't have a lot of money, so everything was done on a shoestring budget. The flight to the uk took 44 hours stopping off at bangkok and warsaw for 7 hours each. I finally got to heathrow to be picked up by liz and colin and taken to their place in sutton where i stayed for a few months. I do remember being so knackered that i fell asleep and didn't wake up for 1/2 day. I had the problem when i first got to the uk that i didn't have alot of money (£500 doesn't go far) and i didn't really know what i was going to do for work. Most of my jobs had been a bit of development and a bit of network administration, you don't really find those sorts of jobs very often. It took a while to get my first job, went into contracting doing tech support and admin, wasn't really what i wanted to do, but it paid the money and that was all that counted. Since i was earning a fortune compared to what i earned back in australia i arranged for dad and carol to fly one way from new zealand (they were coming to live) for liz's wedding as her wedding present. It was going to be nice to have all the family in one place again. I was only in the uk a couple of months when i came home to be told by my sister that my dad had died. I have to say that was by far the worst day of my life. I know dad hadn't been that well just before he died, which was why he missed his doctors appointment. I don't know if he would have still been alive if he had seen the doctor. I hadn't spoken with dad for a while at that point, probably once in 6 months, and hadn't seen him for about 4 years. I was really looking forward to seeing dad again, spending time getting to know him again, hoping that we could have times like we did when i was at college. It was only a couple of months until he was meant to be coming over to the uk to live. The next few days were the hardest of my life, I didn't want to stay home with liz and colin and mourn, so i went to work, which was better as i was with people, but it was still hard and i was a bit of a mess for a while. Dad was cremated back in new zealand and carol bought the ashes over to the uk so we could bury him here. I think the hardest thing for me was that i hadn't told dad how much i loved him for so long. I know it is something parents probably just know, but it was one of my biggest regrets that i hadn't actually told him in ages. I still think alot about dad and what he would think of my life. I like to think he would be happy with the decisions i have taken. It would be nicer if he was still around now to talk to. When carol arrived it was the first time i had seen jarrad, he was only about 6 months old and was a lovely baby. Liz and colin got married on the 6th september 1997 on the same day as dianna's funeral. Liz asked me to be the "father of the bride". I was very nervous about having to give a speech, and having to fill dad's shoes, but accepted immediately. It was on the way from the registry wedding to the church that i first saw catherine. She was running late (as usual) dragging her ex along behind her. The church part of the wedding was very long and very boring. Before we went on to the reception i got the chance to meet catherine properly. I had a lot to drink that day to get over the nerves of having to give the speech (strangely wasn't drunk though). No matter how many half bottles of wine i had open, catherine always new where one was when i came around asking. It was a bit of a strange day, her ex was wanting to get back together. Me and catherine spent a lot of time talking (and being interrupted from people her ex sent to see where we were) Well, to say the least, we hit it off, she even invited me to go to florida with her in the december. The next few months went by very quickly and i was happier than i had been for a while. Sue arrived and moved into the flat with me in barnes, me and catherine were pretty much inseparable. Ashley came over to travel for 6 months to try and take his mind of his divorce. I spent a bit of time with him getting to know him again, and he was a bit of a worry. He had been going to a physic every week for a while and she had told him that he would travel and meet a girl from the south (yea i know how vague can you get). As you can imagine, every girl ashley met on his travels was from the south of somewhere. Me and catherine had our first holiday away to disney world in florida. We got there tried to book some tickets to find that i had no money in my account, luckily it was just a matter of calling the accountant to get some transferred, but wow was it embarrassing. We had 2 weeks there, had an amazing time, you just become a big kid again when you are there, but the first time is VERY tiring, getting up about 6-7am to get in the parks early, getting back to the hotel about 10-11pm, when we got home we were knackered, thankfully christmas was coming up so we could have a relax. My first christmas in the uk was a bit awkward, i wanted to spend time with my family, but also wanted to spend time with catherine. I made a bit of a compromise, spent the morning and lunch with liz, colin,carol and jarrad, sue came along as well and we went to colin's parents place for christmas lunch. By mid afternoon sue drove me over to catherines place in one of her friends cars. liz and carol came along with us. Sue wasn't used to driving a french car and managed to bump off a bollard and pop 3 tires. We were sooooooo lucky a tire sales guy drove past and got us 3 new tires for the car. I spent the evening at catherine's place with her, her mum(pauline) and i think her sister(tracie) and neice(jorja) were there as well. The next year flew by, i had a couple of contracts (only for 2 companies) and was enjoying the work i did. Liz was pregnent with Emily, and trying to move house at the same time. carol was living in a council house which was horrible. I did see both liz and carol quite a lot at that time. With catherine having been one of liz's friends i would have thought we would have seen them more, but liz thought catherine was taking control of me so there was a bit of tension between them. Liz arranged a family holiday to canada to see my aunt, uncle and cousins over there, but she didn't want catherine to come. It was really hard for me, i didn't want to go without her, but i really wanted to meet my relatives. I did go by myself, stayed at my cousin anne's place. Some parts of that holiday were really good, i missed catherine alot and called her regularily. Liz in her over organised way had a plan of what was happening every hour that we were there, which me and carol promptly ignored. that in itself i think made the holiday better. Montreal is a lovely city to see in october. By the end of the year when the lease ran out on the flat, so me and sue decided to go our separate ways house wise. I only had about 6 weeks left till i was heading back to australia for richard and kelly's wedding, so i moved in with catherine. Pauline was in australia so we had the house to ourselves. Pauline came back from australia a few weeks before i was due to go over, and i will always remember coming home that evening to find all of my shirts perfectly ironed (i ironed when i needed it). I got on really well with pauline, she reminded me alot of my dad so living with them both was really nice. I went back to australia and was horrified at the state of my house. It wasn't that it was damaged or anything, just that it wasn't really looked after. Richard and kelly's wedding was good and it was nice to catch up with everyone again. When i got back from australia i was going to start looking for a new flat. Catherine said i should just stay at her place, it didn't really take much persuasion. I lived with catherine and pauline for a couple of years and life there was good. Liz had sarah, and was having the fun of 2 young daughters. carol moved to a house eventually in wallington, i think it is the same one she is in now. Me and catherine were getting on really well, we did a bit of traveling together. Kenya was my favourite holiday, but we also went to portugal, spain and back to florida. Sue had to go back to australia after her 2 years in the uk, i know she didn't want to, and it was sad to see her go. In 2000 i arranged a 6 week break to go back to australia to sell my house. There were parts of the 6 weeks that was back breaking work getting the driveway and garden area done. Ashley helped me out quite a bit while i was there, and sue's dad did the main plant bit around the side of the house. I smothed out all the rest of the land and spread some grass seeds and put the house on the market. Me and catherine did quite a bit of traveling, we drove down to sydney, then on to melbourne stopping at touristy sites along the way. In Melbourne we stayed a night with catherine's cousin, and she took us to some sights outside the city. On our way back to the gold coast we drove down to the great ocean road, then headed back up through melbourne to sydney. With no travel arrangements I do remember driving till about 2am trying to find a hotel that was open. We went to the blue mountains, via a rather dodgy stone road (yes i took a short cut). When we got back to the gold coast we headed inland to ayers rock, somehow we managed to get there at one of the few times it is raining, it was so bad the roads were flooded and the only way in or out was by plane. It was there that i proposed to catherine. I was going to do it at dinner on valentines day, but panicked and waited till we were back in our hotel room. I don't know why i ever thought she would say no, lucky for me she didn't :). When we got back to the uk we started planning the wedding, it wasn't going to be for a few years, but you do have to look around early for a place to have it. Not alot else went on during that time, alot of wedding organisation. I was still working for threadneedle investments and had moved up from the helpdesk to network projects. We found the venue for the wedding quite early and were constantly going to wedding fairs to find all the little bits for it. To make things harder we decided to buy a house. Looking for a house in london is a nightmare. We looked at so many places and for the budget that we had, the options were looking decidedly bad. We were VERY lucky to find a 4 bedroom home in richmond. it then took nearly 6 months to be able to move in. 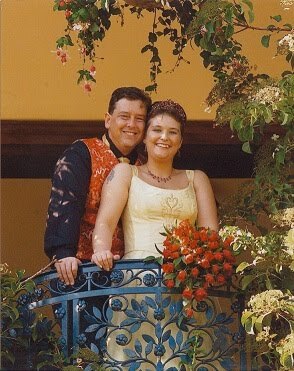 We got married on the 10th of august 2002, it was the happiest day of my life, yes it was also a very stressful day, everyone had things they wanted from us, and alot of people forgot that this was meant to be our day. In the end it was a good day and i have lots of good memories about it. i was so pleased that both sue and ashley came over from australia for it, loads of our friends and family turned up. We went on our honey moon to bali, and it was amazing. We landed in bali and had a 4 hour trip across the country to the villa. It was an amazing place, 20 metres from the beach, our own pool, a butler to serve us breakfast, lunch and dinner. the people that ran the 3 villa's were incredible, really friendly and made our stay there the best time we had ever had. When we got home we collected the keys to the house and moved in. The moving was a bit of a nightmare. Pauline went into the house and cleaned it from top to bottom (and it needed it) I had a van, and most of the days it was just me and catherine lugging the boxes around. luckily my cousin paul helped me out on the last day and we managed to get everything into the house. Most of the white goods that we had orded didn't turn up, so we were living in a house with no fridge, no freezer, no cooker. It was a bit of a nightmare for a couple of weeks, but we didn't really care, it was ours. Not long after we moved in the company that i was working for ran out of money, and it was 3 months before i managed to get a new job. As you can imagine, we had just bought a new house, just paid for the wedding, money was tight as it was without that. Luckily one of the guys that i used to work with refered me to someone he was working with and i got another job. The company amplefuture that i worked for was a really strange place. Their main business was "adult" phone lines, but they also did alot of mobile content which is what i had been working in. There were alot of issues to get around when i first started the job as some of the people thought i was there to take over from them, and they made life a bit dificult at first. Luckily things calmed down and it was good to work there, the people were good and the boss had pretty much let me do what was needed. It was about that time that catherine took a redundancy package from ernst and young, she had been wanting to get out and change careers. She started working for the same company as me as our hr manager. It was great having her in the same company, we got to spend more time together and we were both enjoying out jobs. Unfortunatly it only lasted about a year i think when her boss was changed, and the guy that took over was a real control freak. Catherine found it really hard to work with him, and was getting stressed all the time, so she quit. Six months later i had to go to australia for ashleys wedding, and catherine was still out of work. That was a really hard 6 months, catherine was loosing confidence in herself on a daily basis, and everything was getting really stressful. The trip to australia didn't really help, catherine needed to stay at home and find a job. Ashley was really needy during that period, and i had to be with him the entire time which annoyed me as i had plans on catching up with all my other friends while i was there. 2 days before the wedding catherine came over which was great, but the pressure ashley was putting on me to be with him all the time was a pain and it ended up with me and catherine having a huge fight the night before the wedding. I didn't see her that night as ashley wanted me to stay with him, and the next morning catherine wasn't answering my calls. To say the least the day they had planned for their wedding was strange, they actually got together before they were married and went to the anzac parade so they could be seen together and have some photo's taken. Luckily catherine came to the wedding (she had threatened to not come) and we had a long talk and made up. I saw a side of ashley while i was there that i really didn't like. He had the idea that the best man was there to run around for him, he obviously forgot that he didn't have to do anything other than turn up and make a speach at my wedding. I can't say i really liked his wife, she was very needy herself (probably why they got on so well) and she was very vain (i don't like vain woman) Well me and catherine patched things up that evening, and the next morning we went for a look around brisbane together. The plan for the next week had been that me and catherine would stay at ashley's place and have his car while they were on honey moon, but they way they made us feel we decided to book into a hotel. I managed to get hold of kylie's brother who managed a hotel in brisbane and he got us a room for the week. Having the car was good, we went and saw loads of things, managed to see simon, becky, richard and kelly for one evening, unfortunatly because of the previous week being stuck with ashley i didn't manage to see anyone else that trip. When we got back, catherine managed to get a part time job working for an australian wine company, and things started to get better. The next few years were nothing out of the ordinary, we went on holidays when we could afford it, catherine was enjoying her job and eventually got made permenant. I changed jobs as well, went into mobile marketing company. Things were tough at that time, because of the amount of time we had both had out of work in the past few years, we had spent heavily on our credit cards, and had loads of debt. That really did put a strain on things and we had a few bad patches in the relationship. It is hard to say when things really changed with us, but catherine was working for a really social company and going out with her new friends alot, i was working lots and going out with people from work every so often, we seemed to just drift apart. We did notice it and for a while we tried to make things better, but really i think that was the start of the end. We were different people, and our lives were moving in different directions. In this part of the story i am probably skipping quite a bit partly because i don't think it makes to much difference to what happened, and also because i really don't know when and what went wrong in the end. I know the lack of money didn't help, pretty much all my wages at the time went into paying the bills, so we didn't really do much and i know that was very frustrating to catherine. The company i was working for ran out of money (yet again) and we were all made redundant. It wasn't to bad for me, i had already been looking to leave and managed to get a contract with virgin media within a week all the time looking for a permenant position. I had an interview with the company i am with now the friday before i started with virgin, and had a job offer a couple of weeks later. I was in a contract though and really didn't think they would wait for it to end. They did, and that really blew me away. I started working with ioko, and nearly left them very quickly as i didn't have anything to do. I was sitting in the office doing nothing, which in the end was good as it gave me time to complete my final java qualification. I did end up getting some work which was a bit stressful, but enjoyable so i stayed. Well, as i said earlier, we tried to keep things going in our relationship for a while, and eventually on february 7th, 2009 catherine told me that it was over. It is hard to explain how i felt. Yes i was devistated, but i think i was more relieved. Life had not been fun for a long time, we were living in the same house, but we were not living like a married couple unless someone was around and then it was as if nothing was wrong. I can't say i was happy that we had split up, but i was happy that it wasn't just me that was feeling like that. The next few months were really strange, catherine had setup a blowup bed in the front room, and was saving so that she could move out. We were actually getting on better then that we had in the past year and it was quite nice even if it was really bizzare. Since it was going so well, i do think i thought we would get back together, but i am glad we didn't, i am sure if we did the same thing would have happened again. It took catherine a couple of months to find a place and move out, and that was when things got really strange for me. Living in a 4 bedroom house all by myself, i would just wonder around the house trying to figure out what was happening. Taking on all the debts was a big strain for me at the time, so i can say without a doubt that i didn't have much of a life for a while. I was still in touch with pauline quite a bit, she didn't care that me and catherine had split up, as far as she was concerned i was one of her sons, and i do love her like a mum. It really helped to have someone to talk to about all the issues we had had, and how i was feeling. I know she was getting all this from both sides, but as a good mum, she never ever took sides between me and catherine, she loved us both as much and wanted us both to be happy. To get over the heart ache of breaking up(yes it was still tough) i threw myself at my work, sometimes that was a good thing, sometimes it was really bad and i know at one point i was getting really badly stressed out, but it was all my own doing, no one at work wanted me working the stupid hours i was, they even told me i shouldn't be. I did try and get my life back into order. I realised how much of me i had suppressed over the years to make catherine happy, all the things i had wanted to do but hadn't. I know catherine would never have wanted me to not do them, i just didn't as i knew she wasn't interested in them. One of my friends neil moved into the house, which was good. not only for the company, but for the extra money, it meant that i could actually start to have a life. I started doing the whole internet dating thing at that point as well, and it seemed to be going ok. It was probably a bit early to be dating, but i did enjoy going out, and had some really nice dates and met some really nice ladies. I can't say i had any proper relationships, there was 1 girl that got a bit serious a bit quick, which scared the living crap out of me at the time so i broke it off, but other than that as i said, nice ladies and it was enjoyable to be out meeting people. I have even managed to remain friends with some of them, so it can't have been all that bad. The first year we were seperated i was either working to much or going out clubbing to much. I got to the point where the bar maids at one of the local clubs in kingston knew my drink off by heart, and would start making it as soon as they saw me coming to the bar. I really had become a regular. Work was good and bad, i loved my job, I was working on a really challenging project for disney world in florida. I know i poured everything i had into that project i think it was a bit of an outlet for me. The really good part about the project was when stuart (my PM) told me he needed me to go out to florida to do the installations with the client. I have to say i was really bored when i got there (work wise) but i won't go into that, but in the evenings we had a really good time. Most of the trips over there were only 2-3 weeks, sometimes i was by myself which i didn't mind, other times with stuart and peter. I have to say i did enjoy the trips out there. stuart had been out there so long that he knew all the bar staff at the best resturant in the parks area. I saw a lot more of florida on those trips than i did in the 6-7 trips that me and catherine had done over there. It was a bit scary that i didn't need a map of the area, i had been there that often that i knew my way around, knew were all the shops were. One of the benefits of traveling so much was that i would leave my car at liz's place since she lived near gatwick airport, so during that period of time i got to seem not only liz and colin more, but emily and sarah as well. Me and liz got on alot better during that time. Sue sent me a mail one day while i was in florida, inviting me to her 40th birthday, i am sure she never expected me to accept, but i had been working so much, and i was told that i had to go on holiday, so i booked the flights and went back to aus for her 40th birthday. It was great to see her again, and the party was hillarious. it was a fancy dress, i went as hanibal lecter ;) It was nice to catch up with a few of my other friends. I had a night out with simon, neil and adrian, and caught up with kerrie and her new baby. most of the other days i spent sight seeing, it was strange since i had lived there, but it was nice to have nothing planned to do. I just went places, saw things, had a good time. the first day i was back at work after that trip i think i had to book quick tickets and head straight back out to florida. I think i was out there for 5 out of the next 7 weeks, i can't say i didn't enjoy it, I had some good times while i wasn't working and have some good memories of that time. That year was my 40th birthday, and yes i had a week of celebrations, but alot of that was just because it was around christmas and i managed to catch up with a few friends, and there were a few christmas parties on at the time. I know i went out by myself on the weekend and drunk far far to much. When i think back on it, it was a really depressing week. I had never expected to be single at 40, and it really made me wonder what i was doing with my life. I won't go into that period of my life, as it was quite depressing and i compensated by going out FAR to often and drinking far to much. That christmas i went over to liz's place, and it was only the second time in my time in the uk that we had all the family at the same place for christmas. I did have a good time, and was glad that i went. Well, the time is wizzing past, this year there hasn't been to much of note in my life, i went skiing again this year, first time in about 6 years, unfortunatly i came home on crutches, but it wasn't anything major. Work is still going well and i am enjoying myself. I got back into my running, but when i had my accident, running hasn't been the same since. I spent 4 months renovating my front room (yes it was a BIG job), i am really glad that is over, my house looked like a bomb hit it for ages. One of neils friends jim moved back to the uk, and moved into one of the spare rooms for a month (he's still here :) ) Things in the house are going well, having 2 other guys in the house is ok, most weekends i have the house to myself when they go to their girlfriends, during the week it is a bit hit and miss who is home. I am still doing the interent dating thing, but not really pursuing it much at the moment. 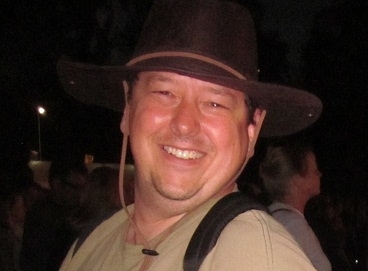 I put on quite a bit of weight over the past 2 years and i am focusing more on getting rid of it. I have lots of plans for doing more traveling, I am actually going to egypt next monday morning. I am having lots of fun with the banks as it is mortgage renewal time, and trying to get all the debt into a managable pile is the main goal. The bank have been pretty good, i am just hoping all the paperwork comes through before i head off on holiday. Well, that is my history, ok there are some gaping holes in there, some of it because i can't really remember it, because i don't really think it would be of interest to anyone, or because it is just to personal and no matter how much i want to tell people what has happened to me, there will always be some things that are private. So where am i, what am i doing with myself now. these are going to be a few of my thoughts of the moment. Well, i have my house, yes it still needs quite a bit of work done to it especially in the yard, but i have time and no matter how hard the work i do actually love it. Work is going well, the job i am on at the moment isn't to much of a challenge, but it is ok and i know it will be over soon and the chance of a new project. My love life is non existent, and i have given up on the whole internet dating thing. I have come to realise that there are not that many woman out there after a 40 year old fat bloke. I am a shy person at heart, i don't know if i come across that way, but i am. I have always found it hard to talk to woman, probably a major reason why i am still single, but then i never really had that problem when i was out on dates which is strange, but there have been times over the past couple of years where i have met someone nice, and for some godly unknown reason i just couldn't get the guts up to ask the girl out. I know what my problems are, but sometimes i just can't get myself to do what i want to do. I can't see that changing any time soon. I don't have a lot of close friends i know that, and i know i have always been very a bit of a recluse. Most of my closer friends live in a different country. There are some people in the uk that i am friends with, but no one that i would say i am really close to. It doesn't really bother me to much, but i would like to have someone close. I haven't been going out to much lately, i have been trying to concentrate more on loosing a bit of weight and getting myself fitter again. I am about to head off of on holiday on monday to egypt to have a nice relax, and do something i have wanted to do for the past 4 years which is my diving. I know i have good friends and family that love me, and i know i am really crap at keeping in touch with everyone. Always have been, probably always will be. As i said, i don't have alot of friends, mainly because i have always been really bad at opening up and letting people in. I think that might be one of the reasons that i started writing this in the hope that opening up about me and my past might help me when i meet new people (not sure if that is good or bad). Not really sure what else to say about me at the moment, life is ok yes it could be better but that is life, it is what you make of it. I have to say writing this has been interesting. There have been times where i have been a bit teary, and times where i have laughed remembering what i used to get up to, especially when i went through all my old photo's. If you have managed to make it this far, wow i am supprised, it has been hard enough for me to re-read. This has been a mammoth task for me to write. I have deleted so much that i have written, re-written alot as i have read it back again, but i am glad that i have done it, even if i am still not really sure why i have done it, or what it is meant to achieve. If nothing else it has been good for me to recall all the good, and yes the bad times that i have had in my life. If i do any other posts, they won't be anywhere near as much as this, mainly just random thoughts and things that happen to me that i want to chat about. thanks for reading through my life, i hope it enlightened you to who i am.